Do you need an “As seen in” block on your home page? What about “As seen on“? “As featured in“? The Featured in block is a pretty popular element in many startups’ home pages or footers. But if you’re not slavishly following web trends, you might wonder what it’s all about. Why add a Featured in block to your page? For customers? I wonder. How many users of the services I linked to above care that they’ve been mentioned in Forbes? The average person—someone who’s not super-tech- or business-savvy—might be slightly intimidated by seeing the Forbes logo on your home page, but it probably won’t mean much more than that to them. More likely, the Featured in block may hold sway with secondary or tertiary audiences like potential partners and employees, the press, and would-be investors. If these are some of the audiences you want to impress, a Featured in block might be worth considering. Isn’t it considered “social proof”? Social proof involves peer-to-peer referral. Think of your typical customer testimonial. I might not know Betty from Boise, but if she sounds like a normal person, and your service has solved for her the same kind of problem I have, I’m probably going to consider her opinion—even with a grain of salt. A Featured in block is more a kind of industry proof—and it only works so long as the publications you’re citing are familiar to, and respected by, your audience. For this reason, and the fact that user’s aren’t fools and know that industry mentions are easily bought in this heady climate of content marketing madness, an industry referral may well be less valuable than a personal recommendation from users’ peers, contacts, or friends. But, you might ask, doesn’t the Featured in block show that your brand has authority? Well, yes … and no. The Featured in block is hardly uncommon—look around the web and it seems these days that everyone’s been featured in TechCrunch, Mashable, and so on. Listing publications that have mentioned your service might just set you apart from the lowest-common-denominator websites in users’ eyes, but it probably won’t do much to set you apart from competitors. And hopefully the quality of your site design, copy, and product or service should differentiate your service just as (if not more) effectively. If you’re going to have a Featured in block on your page, it’s important to work out whose logos you’ll put in it. I might have mentioned your services on my lowly blog, readership: three people plus my cat, and in glowing terms. But you wouldn’t put that on your homepage, would you? Similarly, it’s important to be choosy about the big brands you list. Why? Because by putting others’ logos on your homepage, you’re associating your brand with theirs. Some publications’ logos might turn users off—especially if they actively dislike the publication/s in question. But there are other, more subtle side-effects of listing certain publications on your page. Take a look at the Side Kicker home page below. This is what appears above the fold on my monitor. The app’s depiction on the iPhone tells me it’s an iPhone app. 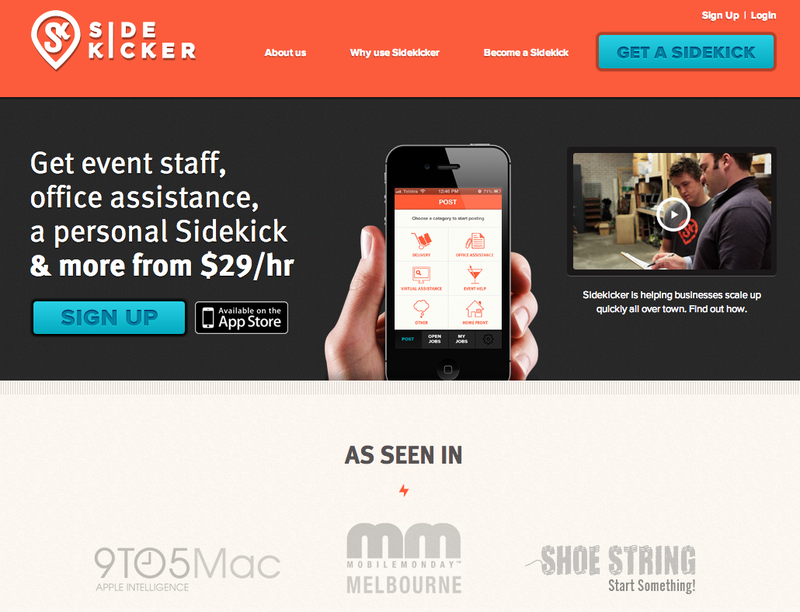 Then, Side Kicker has listed 9to5 Mac as the first item in its As seen in block, and Mobile Melbourne next. I don’t know either of these publications, but I can roughly guess what they’re about. Shoe String? I have no idea. And since the logos aren’t linked, I probably never will. As a customer, though, I don’t think the Featured in block on this page adds much value at all. For me, some testimonials or a description of benefits would be more valuable there. So let’s imagine that we agree the Featured in block is best used to target potential partners, employees, the press and investors, not customers (though I have a feeling you might disagree—and look forward to hearing your thoughts in the comments). What happens if you want to dedicate the entirety of your home page to targeting customers? add it to industry-focused presentations, collateral, and so on. There’s one other big bonus to doing this. Of the sites I mentioned above, only 99designs actually links from the press logos to the articles in which the business is mentioned. I’m guessing that’s because most businesses who use a Featured in block don’t want customers jumping off the landing page to the Wall Street Journal at the crucial point of sale, never to return. There are no links, because links cause leaks in the sales funnel. It’s just bad luck for those who actually want to see what the Wall Street Journal had to say about your service. However, if you put the Featured in block into the other places on your site I mentioned above, or others, you can link the logos to the actual mentions in many cases. That way, they won’t distract your customers, but they will give those other secondary audiences worthwhile background information that’s relevant to them and their relationship with your brand. Do you include a Featured in block on your site? Why, and for which users? I’d love to hear how you’re using this content element in the comments.